Ray here! Brighten Your Life Creations (BYLC) is the current state of an ever- changing arts and crafts business founded by my wife Gina and I as a creative outlet and a fun way for us to spend some quality family time together. BYLC originated as "Claythings"--our first venture into the arts and crafts community--and it suited our family perfectly. The art form was pottery, with Gina at the wheel and me as the glazer and kiln operator. Our business involved the whole family in one way or another: the kids got to enjoy the weekend vacations to trade shows throughout the Southwest and birthday parties featuring arts and crafts projects for friends and classmates. Creating arts and crafts became an uplifting fixture in our family life. What started off as a hobby on top of two full times jobs, soon evolved into an expensive hobby, then part-time enterprise to help cover costs of materials. As it turned out, attending the shows and festivals to display and market our creations was actually fun, and combined with the fact that people were willing to exchange their hard earned dollars for our creations, we began to think that we were on to something here! Making money and having fun - who'd of thunk it? 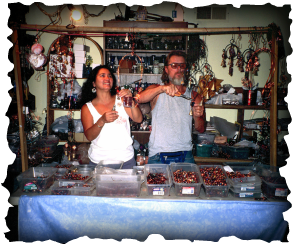 As our kids have grown, they have become more involved in the business and have helped to wrap beads and stones in the wire art, help out in the booth at shows, and generally support BYLC with creative ideas. Over time, our art forms evolved from pottery to decorative stone fountains and succulent planters, to various types of wind-chimes and finally, into the copper wind sculptures and wire art that you see at out shows and on this website today. BYLC is the result of a steady progression of our search for a creative outlet and finding an art form that most appeals to our customers. We really do keep in mind the name of our business, which reflects our motto: We want to "Brighten Your Life" with our "Creations." We hope you find our works brighten your life as much as they have ours!